Featured Image: The Baltic Sea from Max Pixel. A recent study from the United Kingdom is challenging how to think about oceans, by linking animal and plant habitats and the services they provide. This study from the University of Liverpool captures biodiversity and function through a network of linkages, illuminating new ways to think about and conserve ocean health. An ecosystem service is a term used to describe the influences an ecosystem has on human well-being, often focusing on non-material goods. Ecosystem services add value to the way we understand the many functions of the natural world (Costanza et al. 1997). They can change between habitats and biota. For example, a certain fish species may be valued as a source of food, or as a cultural icon for its place in coastal culture. The distinct categories of ecosystem services are important in considering how humans interact with the environment and can add further value to the reasoning to protect marine ecosystems. This study argues that the links between marine ecosystems and their services should be considered heavily when managers and scientists consider how to protect fragile ecosystems. Some services are ecosystem-specific, such as flood control which will be treated differently according to where it occurs. A benthic system from NOAA’s monitoring project. The study used service providing units or SPUs, which describe the space that an ecosystem affects. Documenting SPUs for systems is a way to capture the biodiversity of a system and the associated services including both material goods and non-material benefits. The study seeks to demonstrate that when ecosystem components are thought of as SPUs, the systems can be understood in a new way. Recognizing the various and specific services an ecosystem supplies can show that humans relate to ecosystems in a plethora of ways. An SPU can be composed of an individual organism and an ecosystem, such as “fish in oceanic waters”. To investigate connections in marine systems, the team used models to connect different ecosystems, biota, habitat, and ecosystem services. Focusing on the Mediterranean Sea, the Baltic Sea, the Black Sea, and the northeast Atlantic Ocean, they created a network of ecosystem components and services. A matrix was created to link the two mechanisms: an ecosystem component and the relevant service it provided. The article referred to whales as a strong matrix connection; whales dwell in deep oceans, but whale-watching provides a coastal service. The study included both direct and indirect interactions. An example of a direct interaction from the study is the interaction between fish and the supply of seafood as they relate to the accumulation of biomass in a system. Indirect interactions were considered important when biota moved across habitats, such as mobile species like whales rely on many habitats beyond where they physically dwell. 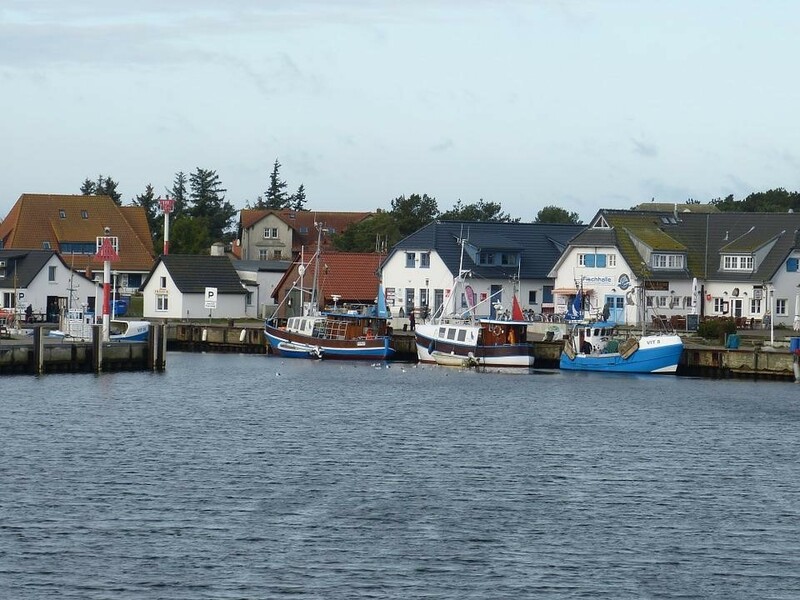 The coastal port on the Island of Hiddensee on the Baltic Sea. Source: Max Pixel. With these networks, the connections between ecosystems become apparent, and further research and management has a better tool to understand how to protect the components and valuable interactions. The study highlighted that coastal systems – both to open water, pelagic, and the lowest level of the ocean, benthic – display the most connectedness to ecosystem services. While this may seem obvious as humans have long lived alongside the coast, the study points to the marine habitats as promoting more than fisheries and recreation. Salt marshes, seagrass beds, and benthic sediments were also connected to global economy. Similarly, less striking elements of the ocean took center-stage in their findings. Benthic invertebrates were shown to be highly connected to ecosystem services because they are abundant in these systems. Their habitats are highly threatened by fishing and coastal development but remain understudied and potentially undervalued. The team argues that studying connectivity in marine systems is essential to understanding how the service supply of the ocean is being affected through various disturbances from human activity. Ocean managers can look at these connections when considering how to preserve habitat for biota. Overall, the study promotes decision-making that takes marine connectedness into account. A better understanding of interactions between habitats and services in oceans can preserve many parts of an ecosystem that could inform management, conservation, and future research. Interested in learning more about ecosystem services? Check out what a world without coral reefs could mean for coastal communities or how benthic systems can improve fisheries.